The Start Line will be located on Columbia Street, next to the Algonac Post Office. 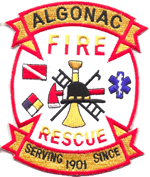 The Finish Line will be located on the boardwalk, along the St. Clair River, directly across from the Algonac Post Office and Algonac Fire Department. A water station will be located just after the 2-Mile and 4-Mile points on the 10K course, and there will be no water stations located on the 5K course. Please plan accordingly. Bathroom facilities will be available at the Start and Finish Line areas.